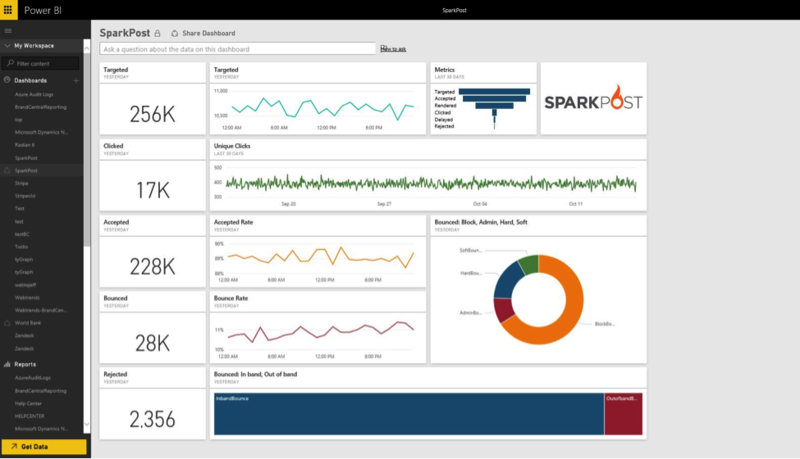 SparkPost is proud to announce a powerful new integration with Power BI. The recently formed partnership with Microsoft’s cloud-based business analytics service is designed to provide customers with a single view of critical business data. By connecting Power BI to your existing SparkPost account, you’ll be able to use the Power BI SparkPost content pack to monitor, explore, and visualize email metrics. The content pack allows you to easily connect your SparkPost data and begin to discover insights with an out-of-the box dashboard, reports, and curated data sets on Power BI. The Power BI content pack can help you analyze your SparkPost data next to multiple sources. For additional details on how to get started, please see the SparkPost content pack for Power BI help page. After connecting with your SparkPost credentials, your data will begin loading into Power BI and you will be notified when the dashboard is ready. In addition to the dashboard, there are three reports that you can drill into by selecting one of the tiles on the dashboard. The reports provide additional insight into bounces and other key metrics. To begin drilling into the reports, select one of the tiles on the dashboard. For example, if you select the Accepted Rate line chart it will drill into the Metrics report. Each report includes a set of visuals with different insights. For additional information you can hover over any of the items, or select a particular value to cross filter other visuals on the page. You also have the ability to customize a report by selecting Edit Report in the top left corner of the page. The edit mode gives you access to the field list, allowing you access to any of the values included in the data set. It also gives you the ability you to edit or add visuals to reports. Any of the visualizations from the reports can be pinned to the dashboard by hovering over it and selecting the pin icon. After the initial import, the dashboard and the reports will continue to update daily. With the SparkPost content pack for Power BI, you’ll have a great initial set of metrics and insights, enabling you to explore your data even further! Product updates will roll out as new versions are released, and SparkPost will continue to support new data sets.